Induced mutations in the waxy locus in rice endosperm did not abolish GBSS activity completely. Compensatory mechanisms in endosperm and leaves caused a major reprogramming of the starch biosynthetic machinery. The mutation of genes in the starch biosynthesis pathway has a profound effect on starch quality and quantity and is an important target for plant breeders. 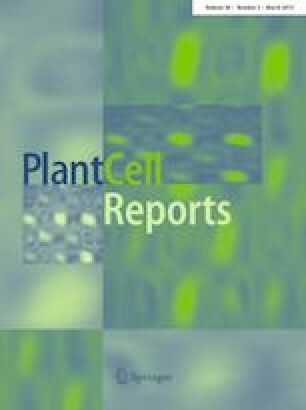 Mutations in endosperm starch biosynthetic genes may impact starch metabolism in vegetative tissues such as leaves in unexpected ways due to the complex feedback mechanisms regulating the pathway. Surprisingly this aspect of global starch metabolism has received little attention. We used CRISPR/Cas9 to introduce mutations affecting the Waxy (Wx) locus encoding granule-bound starch synthase I (GBSSI) in rice endosperm. Our specific objective was to develop a mechanistic understanding of how the endogenous starch biosynthetic machinery might be affected at the transcriptional level following the targeted knock out of GBSSI in the endosperm. We found that the mutations reduced but did not abolish GBSS activity in seeds due to partial compensation caused by the upregulation of GBSSII. The GBSS activity in the mutants was 61–71% of wild-type levels, similarly to two irradiation mutants, but the amylose content declined to 8–12% in heterozygous seeds and to as low as 5% in homozygous seeds, accompanied by abnormal cellular organization in the aleurone layer and amorphous starch grain structures. Expression of many other starch biosynthetic genes was modulated in seeds and leaves. This modulation of gene expression resulted in changes in AGPase and sucrose synthase activity that explained the corresponding levels of starch and soluble sugars. Lucía Pérez and Erika Soto contributed equally to this work. The online version of this article ( https://doi.org/10.1007/s00299-019-02388-z) contains supplementary material, which is available to authorized users. We thank Dr. Caixia Gao (Institute of Genetics and Developmental Biology, Chinese Academy of Sciences, Beijing, China) for providing pJIT163-2NLSCas9 containing the rice codon-optimized cas9, and the empty pU3-gRNA vector. We thank Professor Kimiko Itoh, Graduate School of Science and Technology (Niigata University, Japan) for providing the KUR and Musa Wx lines. This work was supported by funding from the Spanish Ministry of Economy and Competitiveness (MINECO) (BIO2014-54426), and a Juan de la Cierva fellowship to GF (IJCI-2014-19528). LP is the recipient of MINECO fellowship. ES is the recipient of a PhD fellowship from the University of Lleida (BIO2014-54441-P).